Stop Permit Parking in Deal; the saga continues! BOROUGH OF DEAL SEEKS TO RESTRICT ACCESS – AGAIN! 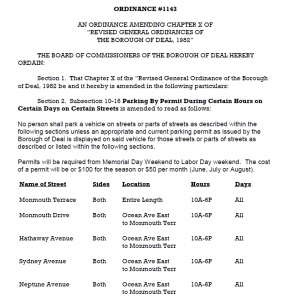 The Borough of Deal is introducing Ordinance #1143 “Permit Parking” on Monmouth Terrace, Monmouth Drive, Hathaway, Sydney and Neptune Ave.This is another attempt to keep people away from the newly replenished beaches, paid for with your tax money. The borough tried to pass similar ordinances in October 2015 and June 2016. But those ordinances were tabled after they were met with fierce public opposition. Critics claim that these ordinances violate their Public Trust rights under New Jersey law. Ordinance #1143 is another slap in the face to local taxpayers, given that Deal’s beaches were recently the benefactor of a $40 million taxpayer-funded beach replenishment project by the U.S. Army Corps of Engineers. The ordinance is on the agenda for the public meeting at 7:30 p.m. Wednesday, April 5, 2017 at 7:30 PM. There will be no discussion on the ordinance when it is introduced, but members of the public will have a chance to chime in during the public comment portion at the end of the meeting. There will be a public comment period on May 10, 2017 prior to the final vote on the Ordinance at Borough Hall, 7:30 PM. We need your help! Contact these politicians and government officials ASAP! Tell them you want unrestricted beach access in Deal! Let them know that the Borough is trying to keep you away from the beach that was paid for with your tax dollars! Assemblywoman Joann L. Downey, Esq.